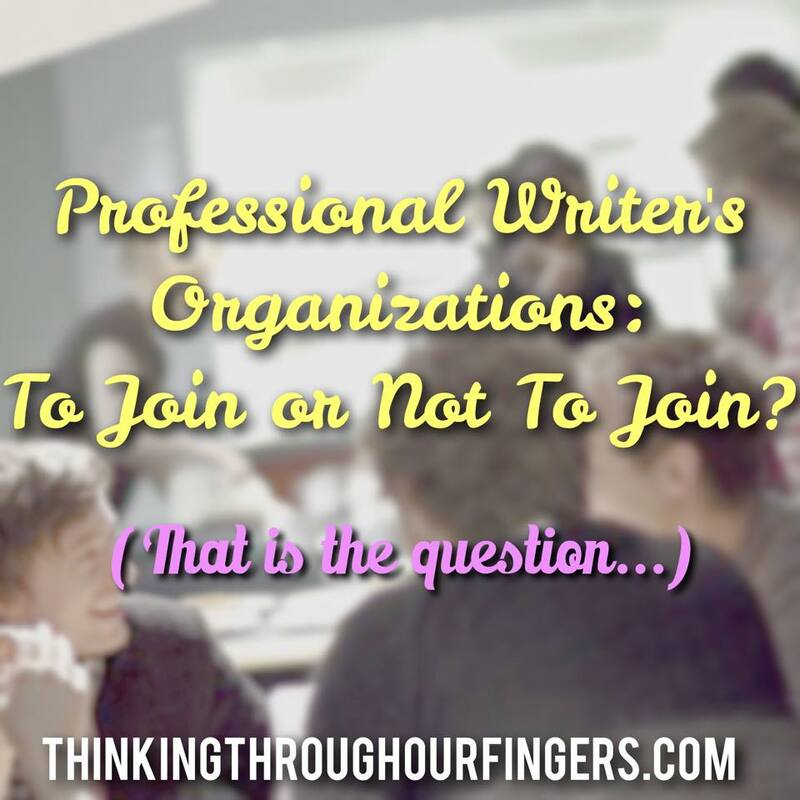 To Join or Not to Join a Professional Writer’s Organization? Okay, so you could probably swim in all the acronyms out there for professional writer’s organizations. SCBWI, RWA, ACFW, MWA, SFWA, NEA, ASJA, and the list goes on and on. You might be thinking about joining one of these organizations, but you might also be wondering what the benefit is of them. Just to have some fancy letters at the end of your bio? Or to put on your query? Do people really care about those letters? I’m not sure they do, but I’ve heard that some agents will pay you more attention if you belong to professional organization. I think it speaks to how seriously you take writing as a career. I myself belong to SCBWI and RWA, as I wrote both YA and romance novels. There are benefits to both. In the SCBWI Insight, a monthly digital publication, there are benefits for SCBWI members. This month, any SCBWI member can submit to any of the agents at the Jenny Bent Agency, even those closed to queries. Worth the annual fee of nearly $100? (It’s lower if you’re renewing.) Maybe, if you really want to query someone and they’ve been closed to queries for a while. Last month, the Insight featured Balzer + Bray, a YA imprint of HarperCollins, and any SCBWI member, agented or not, could submit their query to B+B. Worth it? It was to me! There are also other benefits, including local chapters, where you can meet people who live nearby, get support, and learn from one another. I think the best benefit of belonging to an organization is directly correlated to how much you put into being a member. For example, I joined RWA last spring, when I got serious about writing and publishing adult romance. Since then, I’ve deleted the daily digest emails and moved on with my life. Why did I pay to join? To have the letters after my name. Probably. I really can’t remember why I joined. Ha! But recently, at the admonition of one of my critique partners, I decided to open those daily digests and keep up. I’ve started participating in my local RWA group, getting to know the people there and what’s going on in my region. I realized RWA has a University — a place where other romance authors teach amazing classes on how to write romance!! *mind blown* I took a body language class from a best-selling author at a minimal cost, and it was fan-freaking-tastic. And I was thinking, Why haven’t I been paying attention to this before now? The real answer is time. I have a day job, a family, a life, and getting on more forums or boards, reading more emails, etc. takes time and energy. But I’ve decided if I’m going to invest in these organizations, I should at least take advantage of some of the things they offer. The more I participate, the more I’ll feel like I belong, and the more value I’ll get out of being a member. Have you thought about joining a professional writing organization? Why haven’t you? Liz Isaacson writes inspirational romance, usually set in Texas, or Wyoming, or anywhere else horses and cowboys exist. Her Western inspirational romance, SECOND CHANCE RANCH, is available now. She lives in Utah, where she teaches elementary school, taxis her daughter to dance several times a week, and serves on her community’s library board. Liz is represented by Marisa Corvisiero of the Corvisiero Agency. Find her on Facebook, twitter, and her blog. I'm a very active member of WFWA and it has been life changing for me. The association, the workshops, the way that I can get and give support throughout this journey of publication, what I have learned about the reality of post-publication and re-publication have been invaluable. I've made connections, interacted with amazing people, and been able to discuss the nuances of my genre. There have been times when I've had a question about whether or not to query a certain agent, and I have a friendship with someone who is repped by them, allowing me to determine possible compatibility before querying. I love my professional writer's association.